A six-foot-freshman center from Preston, Idaho, Harley Carlisle has a huge impact on the young, Utah State Eastern women’s basketball team. Her strength combined with her endurance and defensive skill, proves to be a huge asset this year. Carlisle graduated from Preston High School in 2018. She started playing basketball because her older siblings played before her. She grew up watching the game and itching to play. “I danced for a long time and once I started playing basketball, I guess my dancing career was out the window because I fell in love with the sport.” she said. Having started playing basketball in the first grade, it was obvious that Carlisle was meant to play. As every athlete knows, there is always that time where you seriously consider if this sport is worth all the struggles, stress (physically and mentally) and pressure. This happened for Carlisle her sophomore year of high school. She was the only sophomore starting varsity for her high school and started over three senior players, which caused tension within the team. “I was bullied very, very much. My coach wasn’t nice to me, my teammates weren’t nice to me and felt like I wasn’t supposed to be there and there was no reason for me to be there…,” Carlisle said. Suffering from a surgical injury due to appendicitis, Carlisle has not played for three weeks to heal properly. During this time, she was also away from the university, going home to heal in the comfort of her own room with family surrounding her. One thing about college basketball that is always a struggle, is finding a niche within your team. “In college, you have to understand that everyone is the superstar and everyone won basketball player of the year because that’s how college is, they pick the best,” Carlise said. 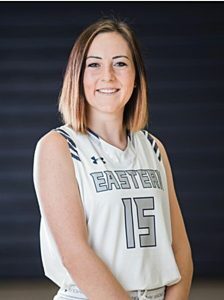 She adapted well to this, coming in off the bench and still getting big minutes underneath Abby Butler, USUE’s starting sophomore. Every morning, Carlisle tells herself: “Today is going to be a great day because you’re alive, you’re in school and you get to play the greatest sport known to mankind.” This is a reminder to all athletes to consider why they do what they do, no matter the adversity they face.